Did a rough sketch of this guy about 12 months ago - finally got around to painting it. 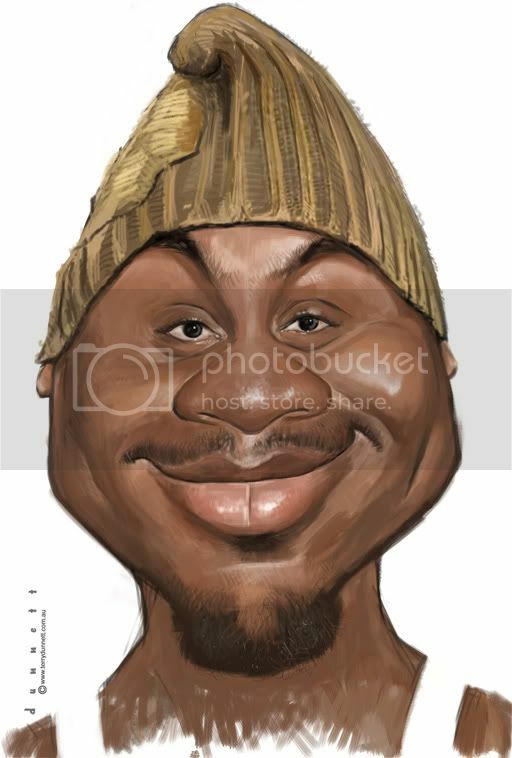 Who is he - Damion has a broad range of artistic abilities from caricature through to fine art - really top quality stuff. He is, I believe, from Los Angeles. Check out his blog, he doesn't post too often, but it's usually worth waiting for. This is very VERY awesome!!!! lol.. you made me look like a smerff, I love it! thank you thank you thank you! Damion is great, thank you Tel for your beautiful work. Great - glad you liked it Damion - should've done the hat blue ! Thanks AMB - glad you called in. Very cool, Tel! I want to paint damion, too. I think I will paint him with watercolors:) Very nice for sure! It's alive! You're good man! I want to be your student! Many thanks Marvin, Toby and Sukas glad you dropped in.